October 25, 2018 (Investorideas.com Newswire) As lithium is declared a "critical metal" in the U.S., a young, NASDAQ-listed company is forging ahead to bring a lithium deposit into production in North Carolina. Lithium is essential for electric vehicle and energy storage batteries. Much of the world's lithium supply comes from Argentina and Chile, but both countries present obstacles. As Argentina experiences economic uncertainty and high inflation, the government has imposed taxes on mineral exports. Mines in Chile face headwinds with high government royalties and challenges with water. In the United States, the supply of lithium has become a national security issue. In May 2018, lithium was included on a list of 35 minerals critical to the U.S. This list was a result of an executive order President Trump signed in December regarding "A Federal Strategy to Ensure Secure and Reliable Supplies of Critical Minerals." Against this backdrop, Piedmont Lithium Ltd. (PLLL:NASDAQ; PLL:ASX) is moving quickly to define lithium resources in North Carolina and bring the deposit into production. The state was the home of two large, historical lithium mines run by FMC Corp. and Albemarle Corp., and Albemarle, the number one global lithium player, is headquartered there. FMC has spun out its lithium unit just this month, forming a new company called Livent Corp. Albemarle and Livent both maintain significant lithium processing facilities in North Carolina. Piedmont Lithium's project—the Piedmont Lithium Project—includes 1,199 acres in the Carolina Tin-Spodumene Belt, the area that produced much of the world's lithium from the 1950s until 1990. It is a spodumene—hard-rock—project, in contrast with the brine projects of Argentina and Chile. 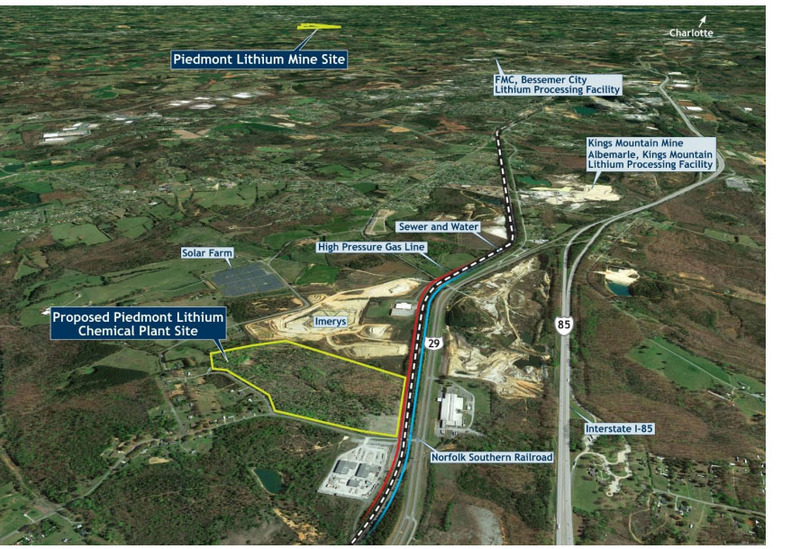 Piedmont's President and CEO Keith Phillips told Streetwise Reports that the state of North Carolina is an ideal location for the lithium mine. "Forbes in 2017 rated North Carolina the number one state in the country for business," Phillips said. "There are no state mining royalties, a 23% corporate tax rate and the state's historical lithium production means there is an experienced work force that we have been able to tap." In June, the company announced a maiden mineral resource for its Core property of 16.19 million tonnes at 1.12% lithium oxide, containing 182,000 tonnes of lithium oxide or 450,000 tonnes of lithium carbonate equivalent (LCE). The company has announced that it plans to convert the mineral directly to lithium hydroxide from spodumene; lithium hydroxide is in demand for battery use and commands a higher price than lithium carbonate, which is what most mines produce. "Demand for lithium hydroxide for batteries is forecast to increase 20-fold, from current demand of 20,000 tons per year to 400,000 tons per year by 2027, as EV sales accelerate," Phillips stated. "Tesla's Model 3 was the bestselling car in the U.S. in August by dollar volume, with nearly $1 billion of sales." The company released a scoping study in July on the vertically integrated lithium project. The study estimates annual production of 22,700 tonnes per year of lithium hydroxide, an initial 13-year mine life with two years of concentrate sales and 11 years of integrated operation, and initial capex of $91 million for the mine and concentrator, with the second-stage chemical plant largely funded by cash flow. Piedmont plans to increase the economics of the project by mining byproducts quartz, feldspar and mica, which provide significant byproduct credits. According the company, the mine will have estimated "first quartile spodumene concentrate costs of US$193/t and lithium hydroxide costs of US$3,112/t, both net of by-product credits and inclusive of royalties" with an "estimated NPV8% of US$888mm and after-tax IRR of 46% with ~2-year payback." Piedmont is investigating extending the projected 13-year mine life. In addition to the Core property, Piedmont has also been exploring its Central and Sunnyside properties, with results yielding "significant intercepts of high-grade lithium mineralization, including 34.0m at 1.04% Li2O of continuous mineralization across one pegmatite in Hole 18-CT-002 and 20.9m @ 1.42% Li2O of continuous mineralization across one pegmatite in Hole 18-SS-001." CEO Phillips stated, "We are exceedingly happy with the initial results from Central and Sunnyside, with Hole 18-CT-002 in particular being the widest intercept encountered to date. We have delineated a world-class resource of 16.2Mt @ 1.12% Li2O at our Core property, supporting a project life of 13 years as reported in our recent Scoping Study. These initial results at Central and Sunnyside indicate the potential for a significant project life extension." Piedmont Lithium has caught the attention of industry analysts. Joe Reagor, an analyst with ROTH Capital Partners, wrote on October 18, after Piedmont's release of the Central and Sunnyside drill results, "We were encouraged by the initial results and believe the company will look to expand upon these in the near future." Regarding the intersection of 34 meters on the Central property, Reagor commented, "We view this as encouraging as it is a long continuous intercept of high-grade lithium, while the company's flagship Core property did not have continuous intervals of this magnitude. If the company is able to expand upon these results, it is possible the Central property could overtake the Core property in the project development Queue, in our view." ROTH increased its target price to US$36 from US$34 per ADR. Eight Capital does not have Piedmont Lithium under formal coverage, but on October 18, analyst David Talbot wrote, "We believe this early stage lithium developer is in a unique position to leverage its position as a first mover in restarting lithium production within the Carolina Tin-Spodumene Belt (TSB), a historic lithium camp." He also noted Piedmont's "ideal location: The Piedmont Lithium Project has unique strategic value being the only major U.S. lithium spodumene project, shielding investors from emerging market concerns. Low-cost lithium hydroxide conversion direct from spodumene is to take advantage of a Li compound with faster growth prospects and potentially higher prices versus Li carbonate." 5) From time to time, Streetwise Reports LLC and its directors, officers, employees or members of their families, as well as persons interviewed for articles and interviews on the site, may have a long or short position in securities mentioned. Directors, officers, employees or members of their immediate families are prohibited from making purchases and/or sales of those securities in the open market or otherwise from the time of the interview or the decision to write an article, until one week after the publication of the interview or article. As of the date of this article, officers and/or employees of Streetwise Reports LLC (including members of their household) own securities of Piedmont Lithium, a company mentioned in this article. ROTH makes a market in shares of Piedmont Lithium Limited and as such, buys and sells from customers on a principal basis. Eight Capital has not initiated formal and continuous coverage of the companies mentioned in these publications, and maintain no recommendation, price target or earnings forecast. Statements and analysis in these publications are introductory in nature and may be published from time to time based on publicly available information.